The imprisonment in Sudan of a British teacher for insulting Islam has led once again to images of angry Muslims splashed across the newspapers. But according to one British Sudanese Muslim scholar, this is not the true face of Islam and their anger is not shared by Muslims in Britain. 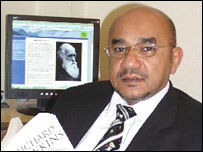 Dr Imad Hassan, 45, is a Sudanese doctor and writer with a PhD in comparative religious studies who has lived in Britain since 1991. He feels that someone from the Sudanese community must speak out against the ruling, and is planning to organise a protest from fellow scholars. "I feel insulted as a Muslim by the government of Sudan, not by Mrs Gibbons," he told the BBC. "Describing the lovely children's toy with the name of Muhammad is a compliment, it is not an insult. "If my own son calls a teddy bear Muhammad I would not rebuke him, let alone a non-Muslim teacher accepting children's natural lovely choice. "The Arabs use lots of wild animals' names as human names. The name 'Hamza', the most beloved uncle of the prophet means 'lion' which is wilder than the bear. "The prophet Muhammad himself in his lifetime has been insulted by so many people and he has forgiven them, so this is not Sharia law, it is politically motivated." Dr Hassan says everyone he knows in the British Sudanese community feels the same way as he does. "So far I haven't met somebody with a different view, either within the Islamic community or the Sudanese." He also says he feels totally accepted in this country and believes non-Muslim Britons are too sophisticated to be drawn into knee-jerk anti-Muslim feeling. "I've lived here for 16 years and I feel better as a Muslim here than in any Muslim country. "Freedom is a fundamental value of Islam. In the Koran it says faith is a matter of choice - so people cannot have better faiths, it's a matter of choice." Dr Hassan said he believed the Sudanese government was using the incident to demonstrate its hard-line stance and whip up outrage, and through it, popular support. "Any insult or offence provokes an emotional reaction and they thought they may provoke the masses around them," he said. "The people who were out on the streets yesterday were gathered from mosques around the city which are led by laymen, uneducated people. "What we saw yesterday were poor people gathered from the city who are more emotionally motivated than intellectually." Dr Hassan says he feels compelled to generate support for Mrs Gibbons among British Muslims. "I will try my best to motivate Muslim scholars to speak out to show the original conviction was unfounded... to show that there was no insult to the Prophet and clear her name. "I feel a sense of responsibility. I would like to send my apologies to her family on the behalf of the Sudanese nation."